My children amuse me. I know everyone is amused by their own children. Children are like most people–incredibly quirky. My children are no different, and I find quirks both fascinating and amusing. Brayden does not mind being cold. He is bewildered when his friends want to go inside after playing in the snow for two hours. Even as a pre-toddler, he did not want to wear a coat out in the brisk fall weather. He just doesn’t mind it. Kaitlyn does not like to be cold. Unless incredible fun is happening, she is done in the snow after 30 minutes. She especially does not like to have wind blowing on her. Spring is not a fun time due to the wind issues. McKenna is like Brayden–she does not mind the cold. She will play outside in the snow forever. Brayden is lucky to have her. That isn’t the quirky part. Here comes the quirky part. Brayden (6 years old) does not like to be cold when he sleeps. He currently sleeps in a sweatshirt, flannel pajama bottoms, and socks. He wears a child-sized snuggie that his grandmother gave him for Christmas. Then he has his sheet, a comforter, a heavy afaghan, his baby quilt I made him, two fleece blankets, and a couple small cotton blankets thrown on top. His room is kept at 70 degrees. Not kidding. Kaitlyn (4 years old) loves to be cold when she sleeps. She has the coldest bedroom in the house. She currently sleeps in a flimsy nightgown meant for warm summer nights and hates to sleep in socks. She sleeps with a sheet, comforter, and a couple of fleece blankets because I think she must be freezing, not because she wants them. McKenna (2 years old) also does not like to be cold when she sleeps. She sleeps in warm pajamas and socks. She has the warmest bedroom in the house. She has more blankets than I can count and she knows if I try to remove some. And she knows which ones I have removed. If she wakes from a nap and had bare arms (because she took off her cardigan because she was “too hot” during playtime), she wakes up crying. I share these quirks to illustrate that some children like to be warm when they sleep and others like to be on the cooler side. ALSO, it takes some observation to know what they each like–it isn’t always what you might assume. I know this is an annoying answer for some people, but for me, I just knew. I could tell Brayden liked to sleep warmer as a baby. When Kaitlyn came along, I quickly figured out she liked to be cooler (and I got many lectures from certain relatives about her lack of socks–she hated socks as a four week old and still hates socks as a four year old and I feel so vindicated as a mother!). The best advice I can give you is to pay attention. You need to notice patterns. You might need to take notes to see these patterns, or you might be able to track it in your head. What did your child wear to sleep in? What blankets, if any, were involved? What was the temperature in the room? And with that information, how did your child sleep that night? It seems most sleep experts agree somewhere between 65-70 degrees is best (though some go as low as 60 and high as 75). That really is a wide range, though. 60 feels very differently than 75. How do you tell what is best for your individual child? Once again, this is where the power of observation comes into play. You have your range to work with, now experiment and see what works best. Why is temperature so important? “Experts agree the temperature of your sleeping area and how comfortable you feel in it affect how well and how long you snooze. Why? “When you go to sleep, your set point for body temperature — the temperature your brain is trying to achieve — goes down,” says H. Craig Heller, PhD, professor of biology at Stanford University, who wrote a chapter on temperature and sleep for a medical textbook. “Think of it as the internal thermostat.” If it’s too cold, as in Roy’s case, or too hot, the body struggles to achieve this set point. Finding the perfect temperature gets tricky with the more people you add to the family. I recommend you figure out what the lowest temperature needs to be. So in our family, my husband and Kaitlyn like to sleep in a cooler environment. So the thermostat is set to a cooler temperature for those two. Even in the winter, my husband sleeps with only a sheet and a light blanket. No socks. Then the rest of us warm sleepers adjust our environment as needed. We all wear warmer PJs and all wear socks in the winter. We all have our layers of blankets. The children have space heaters in their rooms that have a thermostat. So in your quest for good sleep in your family, do not underestimate the importance of temperature, pajamas, and blankets. It is a vital element in getting peaceful, continuous sleep. What is perfect for you will not automatically be perfect for anyone else in the home. Work to figure out the ideal for each person and figure out how to achieve that in your home. You will all be sleeping better if you do! Previous Post What Age Should You Start Reading To Your Child? Wow! I had no idea ALL kids were like that, or should I say all people? I thought our family was just really strange, lol!My daughter loves to sleep cool. I often find all of her covers kicked off in the middle of the night (even if it's like 20 degrees outside) and she hates wearing socks in bed.My son however HATES being cold in the middle of the night. The funny thing is that he doesn't like having blankets on, but we have to keep his room pretty warm. Drives me crazy!My husband and I are opposites. I kick the covers off in the middle of the night but he keeps them on. Isn't it funny how different we all are??!! It is funny–wouldn't it be nice if everyone in the same family was the same? It would make setting the thermostat easier 😉 Though I guess it would do nothing for learning to compromise. How funny. Though I'm not surprised. My DH sleeps with only a sheet also. Though my son loves to be warm. He can't stand to be cold. When he was first born we would snuggle under an electric throw and he would make little happy noises and sleep for as long as I would stay under that thing. Maybe it has something to do with being born in winter and living in a log cabin in Montana. I love being warm too. I bet packing is frustrating: for one child you have to bring a down jacket and the other one a sweater!!! So funny that you should post this today, as I just had the most perplexing moment with my babygirl! It's about 80 degrees in East Texas right now, for the first time in a while, so we went for a walk then I gave baby a cooler bath than usual because I myself thought it would feel nice. She did enjoy it. Afterward, I went to put just a onesie on little one and she pitched a fit! She's never done that before, so I gave her some time, then tried again. Same reaction! Now, she's fast asleep with nothing on but a diaper and swaddled in a light, breathable swaddle blanket! Her way of definitely letting me know she was hot and not about to be restrained by some uncomfortable clothes tonight! Thanks for the post! 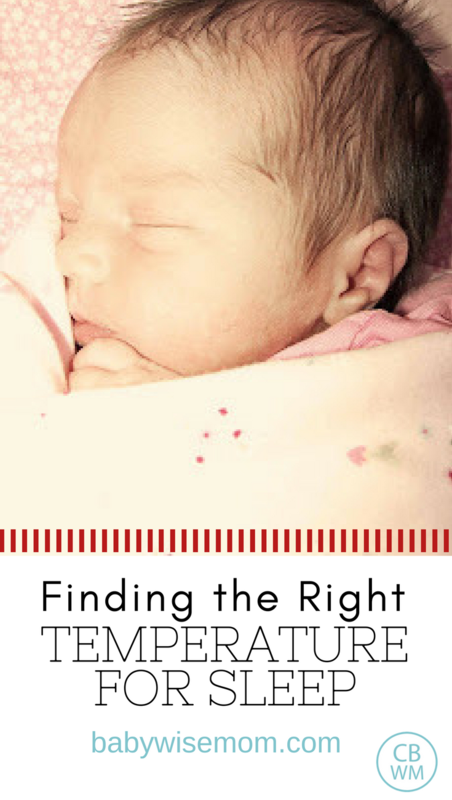 What an interesting post to read, as I have, for a short while, thought I had been noticin that my daughter (almost 5 months) sleeps best in a fairly warm room. I haveno idea how warm our room is at night, but everytime I go in to give her her DF I find myself feeling like my breath was just taken away by the heat! I had been swaddling and putting a blanket on her, but now that she gets her arms free, I had to stop putting a blanket in with her (what is up with babies trying to pull their blankets up over their faces? Scary!) So in order to make sure she sleeps well, I've had to turn the thermostat up – way up.I just asked my husband how he has been sleeping at night, with the sudden change in air temperature, and he said he is sleeping pretty good. I pretty much always sleep well (sleep deprivation makes any sleep that much sweeter, when you get it). So it seems that even we ate not all 'warm' sleepers, we are adaptable for the sake of getting rest while baby is still in our room!It will be interesting to see how things go once baby is moved into the same room as her older sibling. I really don't know what is an optimal temp for my son's room. I'll have to start keeping an eye on that.Thanks for sharing this! It is encouraging, as well as confirms a few things I thought I had been observing. 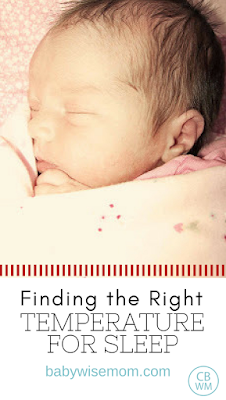 Correction: "So it seems that even if we are not all 'warm' sleepers…"
Great post Valerie. This is so true. So often we try to have our kids sleep how we sleep or how others tells us they should sleep (if it is grandma, this probably means sleeping in three outfits with five blankets 🙂 but we have to look our kids and listen to our intuition on the subject. Just recently with Jacob I started to have him sleep in less layers at night and he started to sleep better in the morning (ok, later in the morning, but that is better for me!). Before I was so worried that he would get cold that I was't really paying attention to what he liked. Thanks everyone for your comments!lol Rachel at the three outfits…and a hat. There must be a hat.